jointly reduce deforestation and improve local livelihoods. These projects typically rely on approaches such as protected areas, material incentives, and community-based initiatives to pursue “win-win” outcomes for people and forests. Despite growing funds to support these projects, research has exposed many practical issues over who benefits and how these projects shape conservation sentiments and behaviours long-term. Against this background, we held a workshop to provide a platform for community leaders, conservation organisations, researchers and government officials to openly discuss some critical issues with how conservation is conducted in the region. In addition, we organised a dialogue event (see below) with researchers and practitioners of the Cambridge Conservation Initiative, a unique collaboration encompassing the University of Cambridge and nine leading Cambridge-based biodiversity conservation organisations. The event aimed to discuss ideas for how to promote more critical reflection and constructive dialogue among practitioners, researchers and local stakeholders over issues with how conservation occurs in practice. This brief report highlights some key outcomes and reflections about both events. 1. Strengthening Engagement: How to broaden participation and foster trust among actors? 2. Understanding Motivations: What is the best way to motivate people for conservation? 3. Improving Monitoring: How should conservation projects be monitored and evaluated? 4. Balancing Power: How to give communities and conservation more political power? The dialogue event was important for bringing together many stakeholders who would not otherwise have the opportunity to discuss issues with how conservation projects are conducted. For example, community leaders were able to voice frustrations over how top-down project designs can lead to unfair benefit distribution and foster mistrust. The discussions further highlighted challenges with better engaging women and youth since many projects work mostly with men. Through the event, community leaders also gained access to key government officials, such as the head of the Regional Environmental Authority. This allowed them to raise issues such as the difficulty of navigating bureaucratic requirements to obtain rights to manage areas for conservation, and the lack of sufficient legal and mediation support to manage social conflicts. how conservation should be conducted. For example, while some people saw material incentives as the most powerful way of advancing conservation causes, others were concerned about the long-term dangers of relying on and reinforcing profit-driven over more intrinsic values for conserving nature. In addition, projects had very different approaches to defining and measuring “success”. It was therefore useful to explore the potential dangers of relying on purely quantitative indicators such as number of hectares committed to conservation and increased agricultural yields, and the complex and sometimes contradictory qualitative information they can hide. In this way, the event provided an opportunity for people to exchange experience and perspectives to explore some of their key underlying assumptions. The dialogue event identified several productive ways forward to help address some of the key challenges discussed. For example, many people identified the importance of strengthening networks among conservation actors in the region to help support community initiatives and give conservation agendas more power to influence broader regional development plans. Communities also said they want to play a more active role in the development and implementation of conservation projects. For example, communities were interested in directly managing more funds and developing local monitoring committees to track progress and engage in public reporting to improve accountability and strengthen trust. However, it was also recognised that improving collective governance capacity, fund management skills, trust among actors, and coordination among diverse funding bodies, would be necessary precursors to making this work in practice. challenges and ideas discussed. This report has been distributed among stakeholders throughout San Martín (500 printed copies) and more broadly in Peru via email networks. possibilities for fostering critical reflection and improved dialogue among practitioners, researchers and local stakeholders over key conservation issues. Half of the participants were conservation researchers at the University of Cambridge and half were practitioners from Cambridge-based conservation organisations, including Fauna & Flora International, BirdLife, UN Environment World Conservation Monitoring Centre, TRAFFIC, and the Royal Society for the Protection of Birds (RSPB). The event began with a brief overview of our effort to foster critical reflection and constructive dialogue among diverse conservation stakeholders in the region of San Martín, Peru. This was followed by a discussion identifying key challenges with fostering these types of dialogues, building on diverse international experiences of the participants. We then split participants into small groups to discuss key challenges to better foster constructive dialogue. 1. 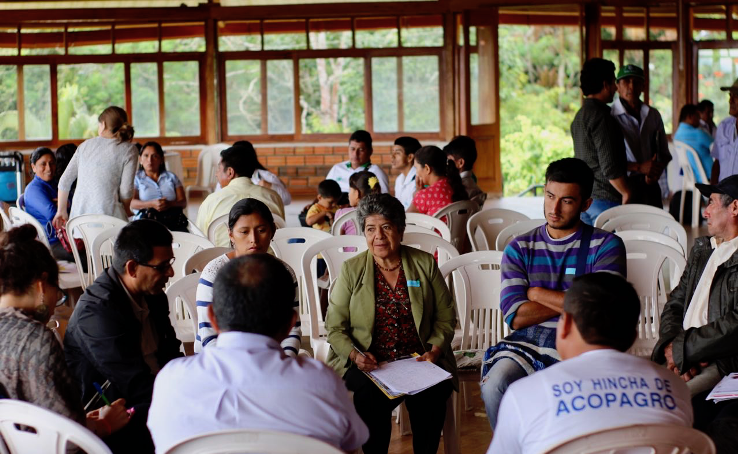 Translating dialogue into action – While people agreed that constructive dialogue is a worthy outcome in itself to shape ideas and assumptions, it was also recognised that all too often interesting ideas are discussed but not translated into action. This is in part because people are absorbed in the trajectories and constraints of their day-to-day work. It was therefore discussed how to better integrate these multistakeholder discussions into specific planning and strategy meetings, which could provide clear leadership and objectives to take ideas forward. 2. Who is involved and legitimacy of representation – People discussed how workshops by their very nature exclude many people, given limited funds and facilitation capacity. It is therefore always important to consider who is involved and to what extent they legitimately represent the views of people who are not present. For example, communities often put forward male leaders as representatives, who may not be representative of more diverse perspectives within the community, such as women and youth. The discussion also highlighted the importance of considering how the event location, format, and use of incentives/compensation can facilitate the participation of legitimate and respected leaders. 3. Understanding and managing different interests and power dynamics – One of the biggest barriers identified to fostering an open and constructive mindset among stakeholders is actors using their power to pursue alternative interests and agendas. Such efforts can shift the focus of discussion, general morale, and shape the extent to which different perspectives feel they have a voice. Several participants shared their experience working with more marginalized groups and mapping out stakeholder interests and power dynamics beforehand in order to buffer potential negative effects on the quality of dialogue and participation of more marginalised perspectives. People also pointed out that smaller scale workshops and opportunities for more continuous discussions may provide a better setting to balance power relations and create open but focused discussions. 4. Overcoming trade-offs between researcher and local interests – People expressed concern that efforts to build consensus among stakeholders can risk glossing over divergent interests, thereby inhibiting productive conflict required to work through and resolve conflicting interests. For example, a conservationist might want to empower communities to better pursue their objectives without explicitly recognizing the extent to which communities’ objectives may vary or conflict with their own. Participants mentioned that it would be useful to learn more about specific methodologies to map differences between stakeholder interests and facilitate productive dialogue which can help to navigate differences in values and objectives to establish shared visions and joint plans, if possible. 5. Fostering an open and constructive frame of mind – People recognised that a person’s mindset is highly influential for the extent to which they are willing to be open and accepting of other peoples’ perspectives. Thus, it is important to explore facilitation approaches which help establish common ground rules, make people feel safe to express their opinions, build confidence during discussions and utilise participatory methods such as role playing games in order to share perspectives and foster mutual respect. people were interested in how the many conservation researchers and practitioners based in Cambridge can better create dialogues which openly question assumptions and help support a more informed and reflective conservation practice. We already had one small follow-up meeting and we are planning on having another meeting of a sub-group of participants next month to take these ideas forward. participated in the Peru workshop (and lack of internet access in communities) made it challenging to outline specific follow-up plans. 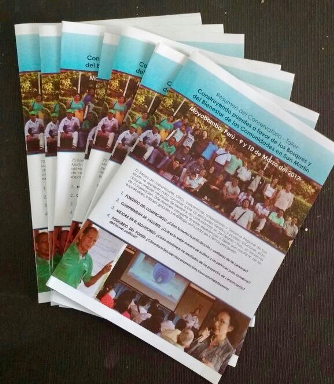 We are making an effort to distribute copies of the workshop summary to remote community areas; however, it is important that these events can feed into smaller scale discussions specifically rooted in strategic planning sessions. In addition, there is very little research conducted by Peruvian researchers which draws attention to the social issues surrounding conservation practices. Thus, in order to strengthen the production of knowledge which is both informed by, articulates with and informs conservation practice, it is necessary that key research areas highlighted by these events can feed into supporting increased research by Peruvians on these issues. assumptions about how to go about conservation. Thus, even if constructive dialogue can help question those assumptions, people may be so invested in particular models or limited by funding that it can be very difficult in practice to bring about changes in assumptions, values and ultimately behaviour. For example, many groups using material incentives were pragmatically motivated by the funding and development opportunities they provided rather than critically considering their links to conservation outcomes. Thus, during efforts to foster critical reflection it is also important to find ways to include those actors who control the available money and shape what people must do to access it. During our events we did not specifically try to include international donors because we worried it could inhibit more honest and critical reflection. However, we recognise it is important (and likely additionally challenging) to extend at least some further discussions to include them. 3. Facilitation skills are essential to the success of any event – Throughout the event we became more aware of how the involvement of more powerful government officials and NGO actors can be a double-edged sword. On the one hand, their close involvement seemed essential for motivating the participation of many people, particularly actors with more power and thus who really should be part of these more critical discussions. On the other hand, we also found it was difficult to foster a critical rather than promotional lens among these powerful actors. As a result, this sometimes pushed the discussion in less reflective, un-critical directions. In addition, we experienced less participation of more powerful actors in more participatory parts of the event such as the small dialogue groups. It would have been useful to better consider these issues in the workshop design and have more extended discussions with these key individuals prior to the event. Similarly, despite our best efforts to involve women in the discussions, we still ended up with twice as many male as female community leaders, and as a result it was more difficult to hear female perspectives. Our experience highlights the importance of pre-workshop conversations and workshop facilitation techniques to level the playing field and manage different interests and power dynamics. In turn this highlights the importance of constructing a longer-term or even continuous platform for critical reflections and discussions between stakeholders, rather than one-off events. Given the gap between conservation project expectations and local realities, we believe that it is critical both in this region of Peru and among conservation work globally to better understand how practitioners, researchers and local stakeholders can develop long-term relationships based on better communication and collaboration to improve conservation practice. The feedback we received from both events highlights the importance of building on these initial dialogues. It is critical to find ways to further explore specific methods for facilitating dialogue which causes people to question deeply held assumptions about how to go about conservation and promote more active relationships among researchers, practitioners, local stakeholders and donors. This can help to co-produce information which can provide useful and constructive feedback to influence how actors pursue dual conservation and human wellbeing objectives. Within the Cambridge Conservation Initiative, we plan to carry these conversations forward during the coming months to consider practical steps to further this sort of dialogue. In San Martín, Peru, we hope to obtain additional funding to support smaller scale discussions surrounding many of the key challenges outlined in the initial dialogue event, but integrated into local planning committees which bring together new actors and strengthen existing conservation networks. We are also working to circulate these ideas to more conservation actors in Peru, and hope to develop more dialogue with Peruvian research institutions over the importance of collaborative research on these themes. The dialogue event will begin with a 30-minute presentation by Josie Chambers (Geography Department, University of Cambridge) and Judith Schleicher (Geography Department, University of Cambridge and UN Environment World Conservation Monitoring Centre) about a recent participatory event they organised in the region of San Martín, northern Peru. The event aimed to foster constructive dialogue between community leaders, NGO practitioners, government officials and academics over critical conservation issues in the region. The talk will highlight priority issues for improving conservation efforts, as well as challenges with fostering critical and honest dialogue among diverse stakeholders. We will then break up into small dialogue groups to explore ideas to strengthen how practitioners and academics communicate and collaborate to address important challenges in conservation practice. We hope to bring together the rich experience of many Cambridge-based practitioners and researchers to develop some concrete recommendations for how to improve future collaboration. Please register online; the event is free, and all are welcome.